With New Orleans Suite, Eric Porter and Lewis Watts join the post-Katrina conversation about New Orleans and its changing cultural scene. Using both visual evidence and the written word, Watts and Porter pay homage to the city, its region, and its residents, by mapping recent and often contradictory social and cultural transformations, and seeking to counter inadequate and often pejorative accounts of the people and place that give New Orleans its soul. 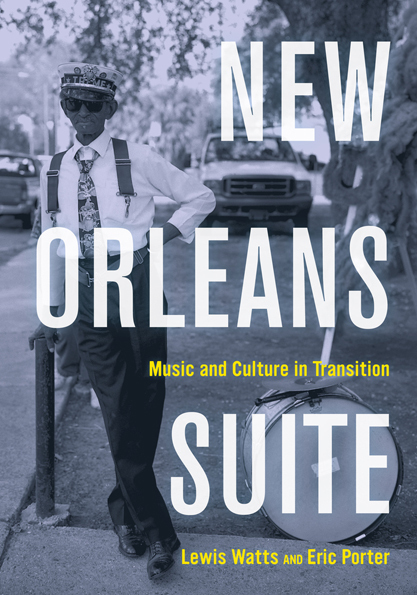 Focusing for the most part on the city’s African American community, New Orleans Suite is a story about people: how bad things have happened to them in the long and short run, how they have persevered by drawing upon and transforming their cultural practices, and what they can teach us about citizenship, politics, and society. Eric Porter is Professor of American Studies, History, and History of Consciousness at the University of California, Santa Cruz. He is the author of What Is This Thing Called Jazz? (UC Press), winner of a 2003 American Book Award, and The Problem of the Future World. Porter's research interests include black cultural and intellectual history; US cultural history and cultural studies; critical race and ethnic studies; popular music and jazz studies. Lewis Watts is Professor of Art at the University of California, Santa Cruz. He is a photographer and visual archivist and coauthor of Harlem of the West, The San Francisco Fillmore Jazz Era. His photography has been exhibited internationally and it is in the collections of major museums across the country. Watts co-authored the 2006 book, Harlem of the West: The San Francisco Fillmore Jazz Era, which features his restorations of salvaged photographs that portray musicians and patrons of the vibrant jazz scene in the Fillmore District during the 1940s and 50s. He is also working on an extended photographic project in Cuba.